Overall it was a good day. As a driver there was a tremendous amount of rust to shake off, plus the challenge of basically a brand new car with a whole new setup, and not having driven on this (deteriorated asphalt) surface hardly at all in years. Dropped a second from run 1 -> 2, then stayed pretty flat time-wise for the next 6 or so runs, but finally broke through on the last couple with another 1.5 seconds. There weren't any other top prep cars in the group to compare to, but had there been, suspect I'd have been about 1 second off the pace. The video is of my last run, which still had lots of big misses, but starts to show what the car can do. How did the mods work? Oil Cooler: Indicated temps were in the mid 90's throughout the session (yay San Diego "winters"!) but the oil temp stayed in check. I took 9 runs all about 10 minutes apart. Leaving with temp around 180, would come back in with it around 220, but it'd be back to 180-ish by the time the next run started. Kept the car idling with hood open and fans on between runs. By the end of the session it was only dropping to 190-ish before the next run, but still not really going over 220. Wheels/tires: No rubbing, and grip was acceptable. Overall I was running too high of pressures for the surface, and kept having to lower and lower. Think I ended up at 36F, 32R, and still wasn't getting the tire to roll all the way over. Some of that is the low grip asphalt, may need to go with higher pressures on grippier surfaces. Suspension/handing: Surprisingly the initial handling balance was quite good. I didn't adjust shocks or bars or anything all day, to give myself a chance to learn the car's behavior, and find base tire pressures. What I found in the later runs where time was dropping, was that I had to be making inputs very early - early braking, early turn-in, early turn-out. Despite the much more racy spring rates and dampers, the soft-sidewall'd tires underneath it all still don't provide the response of a good DOT R-tire. These tires require a much more gentle ramp-up to their limits to keep from shooting over. The mid-corner balance seems good, and exit is good, but there's a little push on entry, and I'm not thrilled with the way the car feels in transitions - but haven't put my finger on root cause yet. Might try softening front bump damping a little. Shock damping curves were provided in an earlier post. Engine/Power Car ran strong. Still haven't had it dyno tuned yet, based on others' experiences there's a lot on the table in a tune. Gearing is a lot shorter, acceleration is lively enough to be entertaining. Exhaust gets pretty loud at high RPM and throttle openings, car blew 92.0db on the best run past the meter. If it's cold/foggy out for other SD events, may have a problem with sound. Should be fine elsewhere though. One place where the tune interacts with the handling is in the realm of lift-throttle behavior. Whether it's for emissions or a byproduct of Nissan's VVEL (throttle butterflies are almost always wide open) - or both - the car hesitates to cut power when you lift the throttle suddenly. It's maybe only a half second or so, but the delay is there, and at the pace things happen in an autocross run, it could be contributing to some of what I'm not liking about how the car enters transitions. For a left-foot-braker it may not be as noticeable, but for right-foot-only me, there may be room to increase handling consistency by having engine braking more closely follow pedal position. Quaife diff - no problems with inside wheelspin here. Based on the handling and power-on/off characteristics of the car, I'm happy with the choice. Haven't really done much in the way of diff mods before, and it was interesting to feel how it changed the behavior of the car - on course and on the street. Seat/Interior The seat held me in great, and the position is nice and low which I like. There is one problem however - it's hard to see out! Between the wide base of the driver's side A-pillar, and the big side view mirror tucked right next to it, it is very difficult to see cones approaching from the left where the radius dictates a speed of 30-40mph. Above that speed you can see them coming through the windshield, and below you can see them out the side. In the video you'll see me lean forward and move around trying to find the cones in a couple left-handers. I also tend to miss those left-hand apexes the most. Had this problem with the stock seat too so I don't think it's a height thing, so much as where I sit fore/aft. I tend to sit further back than most people my height, may have to try sitting a bunch closer... or just get used to it. Next event will probably be the SD Tour in about a month...should have it tuned and aligned by then, but it was "close enough" probably won't change much beyond maybe that slight shock tweak. Did a lightweight "toe-only" alignment last night with the car down at its initial ride heights. With the rear eccentrics all maxed for minimum camber and toe, the rear toe was exactly zero, perfect. I don't have the tools to do a proper camber measurement, but it looks to be in the -2 to -2.5 degree range. The front had moved to about 1/4" toe out with the lowering, roughly one turn of each adjuster brought it to zero. Again didn't measure camber but it should be around -4. Even with its double wishbone suspension, the car needs a lot of static negative to work well. 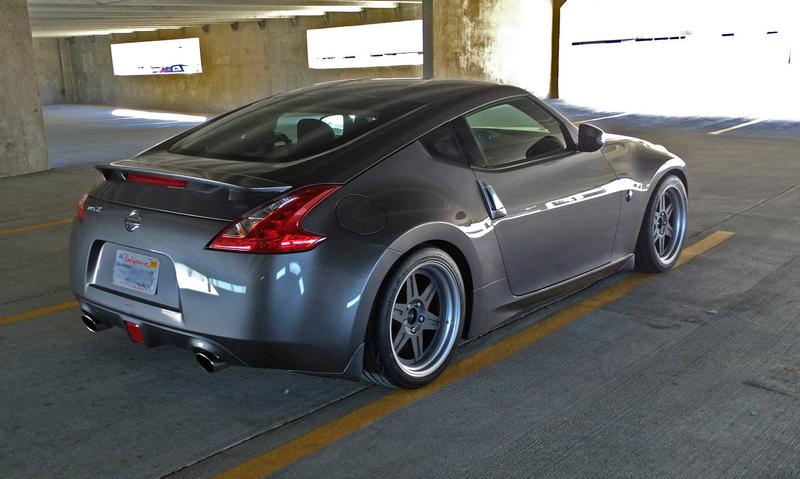 At least, the Z33's (350z's) do...sure wouldn't mind it if I find the car can work with less. Some of these silly camber numbers are driven by the soft-sidewall street tires used in the Street Touring category. While their rubber tread compounds are very advanced providing fantastic helpings of dry grip, life, and wet weather ability - sidewall construction hasn't made the same strides. Of note, the rear toe measurements indicated 74.5" width - pretty wide. There's room to go inboard 2" per side, but I hate the "sunken battleship" look. By some good fortune, these wheels worked out great, their offsets are right where I'd want them, using only the adapting spacer need to make these Camaro bolt pattern wheels fit the Z. For comparison, the Viper was about 77" and a stock C5 Z06 is about 74". 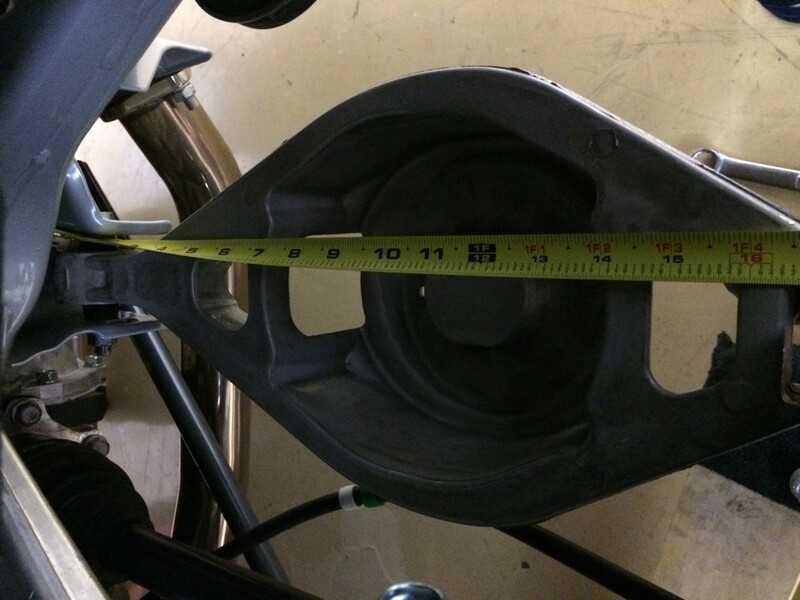 The front measurement was 74 7/8" - a touch wider. 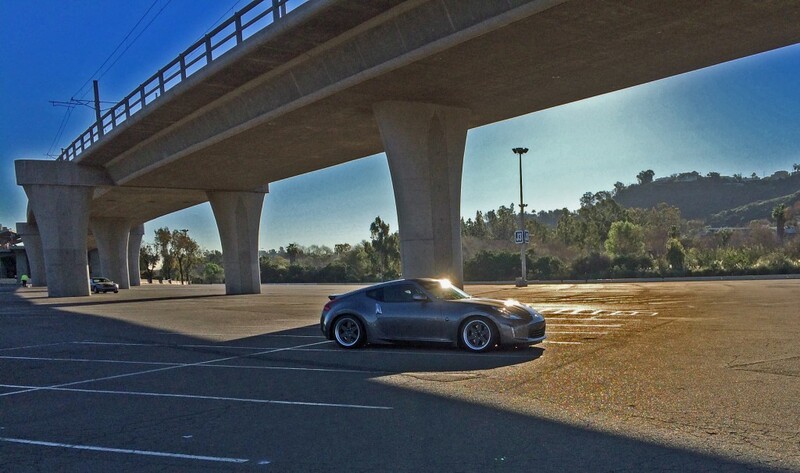 With equivalent camber they'd probably be equal. The car looks soo wide in the rear, but is just as big in front. Drove the car to work today, its maiden voyage in this initial STR trim. On cold startup it's pretty loud at high idle, but settles down within a few seconds. Thankfully it is not loud once settled down, and around town at part throttle. Above half throttle, it really starts to get noisy though. 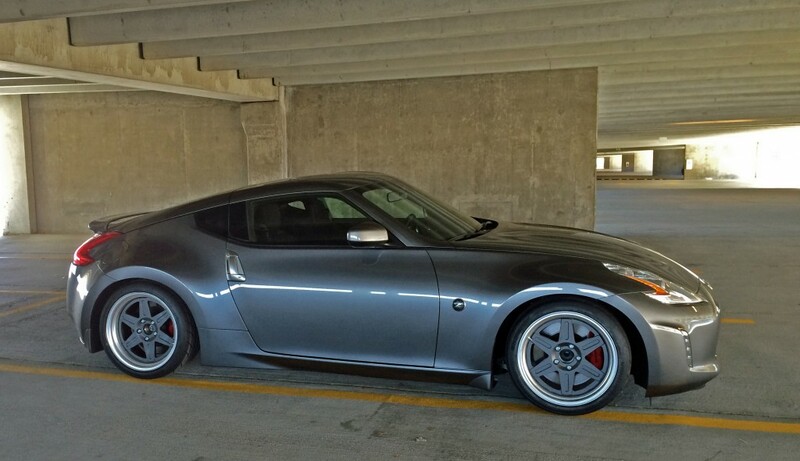 Doesn't sound much like the "Chewbacca" of the Z33's from inside, not sure how it sounds outside. I'm a little worried about San Diego's 92db limit, guess we'll see how it goes. With the big oil cooler, it took a long time for the oil to get up to temp. Coolant was up to its normal spot before oil temp came off the peg (@140 degrees). That's with the thermostatic oil cooler sandwich plate. Car rode comfy and smooth even with the big spring rates and wasn't really any louder inside at light throttle. There's a little bit more mechanical noise/feeling with the rear subframe and diff being locked in so well, but it's really not bad. A lot of that comes from the wheels/tires - these are over 1.5" shorter than stock. That means .75" less ground clearance, and .75" extra fender gap. There are big advantages in gearing, CG, unsprung weight, but there's an inability to go over speedbumps that comes with those advantages. If I end up looking at other wheels/tires, I might consider something taller (like 19's) if need be. The short gearing means the car will be revving higher and when it gets tuned it should still be good for mid 60's in 2nd...but I don't want to be revving it that high any more than I have to. Signed up for a practice Saturday, will try to get it dyno tuned before then. 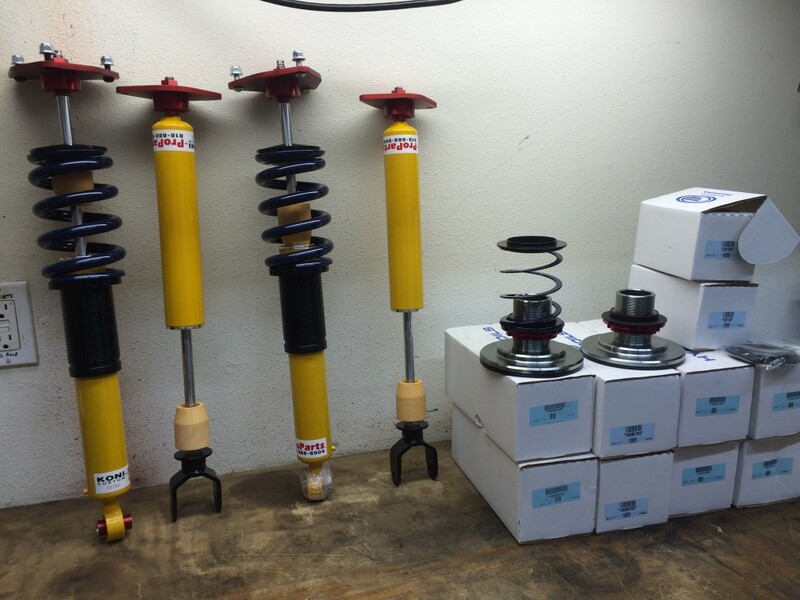 Springs and shocks arrived recently from ProParts USA. When putting together a suspension the actual shocks and springs are just a part of what's needed. You want to take a look at how they connect at either end, and take advantage of any improvements possible. ProParts built a nice set of custom aluminum top hats for the front and rears. Gone are multiple rubber elements, replaced by spherical bearings. The front shock lower mount is also a spherical. 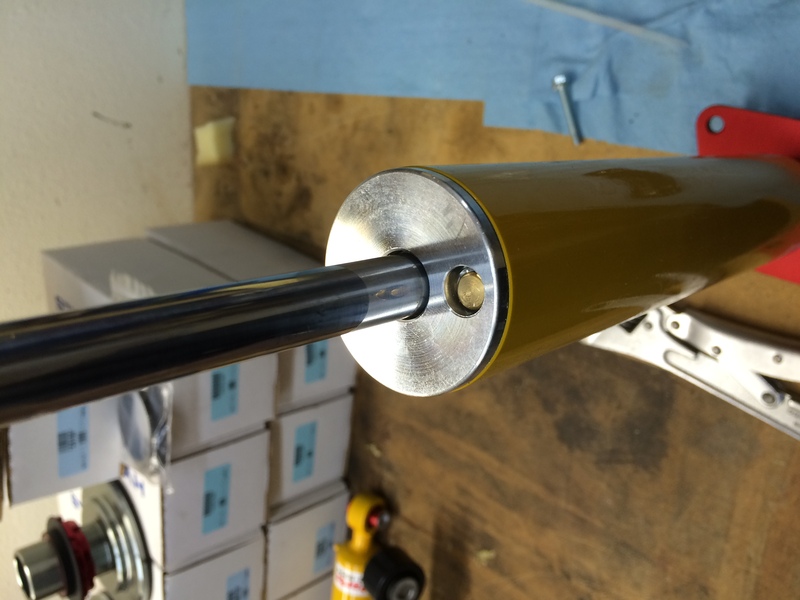 One disadvantage of the Koni 30 series is how Bump adjusts. You have to push this button with the shock fully extended, and "click" it through its range. In the rear it's not too bad actually, as the spring is separate. The front will be trickier with the spring in place. So I put things together with some spring lengths based off what I'd seen on the always-right Internet. 6" front and rear. Of course there is huge variation in this stuff, and 6" ended up being quite a bit short at both ends. Heh, yeah, a bit too low. At this height the front upper control arm is resting on the chassis, and the exhaust is about 1" undergound (if the car weren't up on dollies). 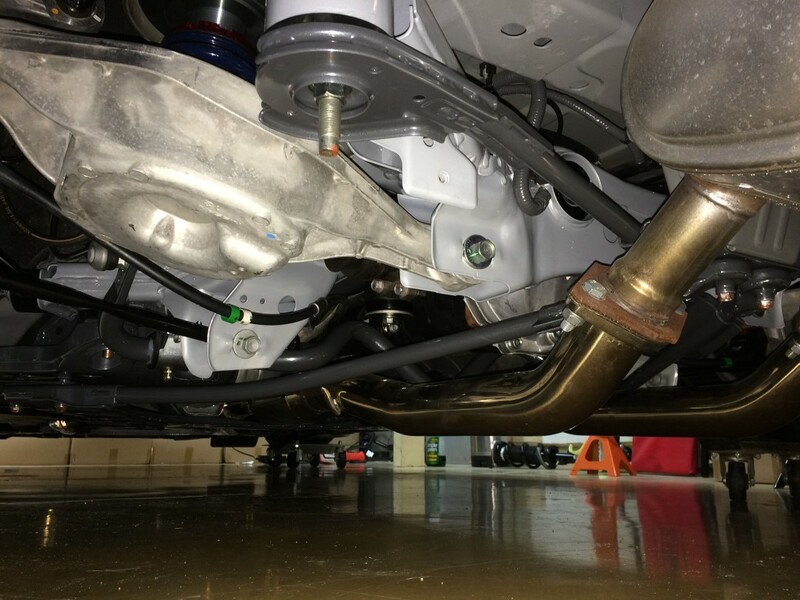 Based on the path the exhaust takes, I think there's ~1" of extra ground clearance to gain by tucking the tubing up closer to those bracing pieces. 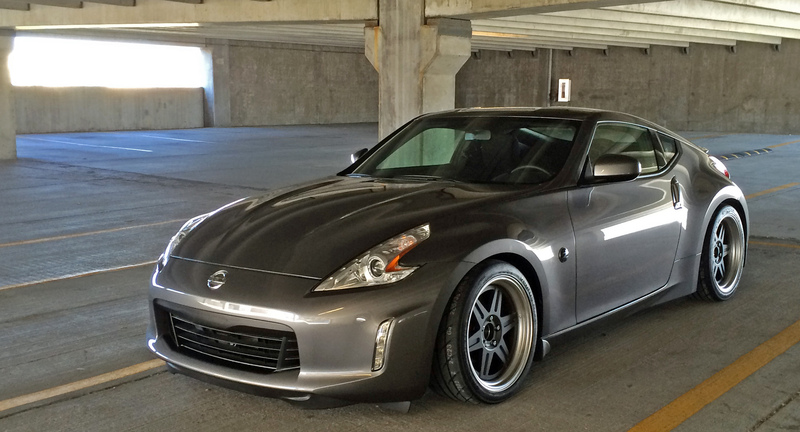 The rear spring motion ratio is fairly "soft" on the Z. As best I can measure, the spring is centered a little bit over 10" out on ~17.5" long arm. Fortunately the shock mounts all the way out at the knuckle, providing great chassis and wheel control. My approach in springing the Z initially is to go a little stiffer in the front, and a little softer in the rear, compared to the fast 350Z's that are out there - specifically Brian Peters. 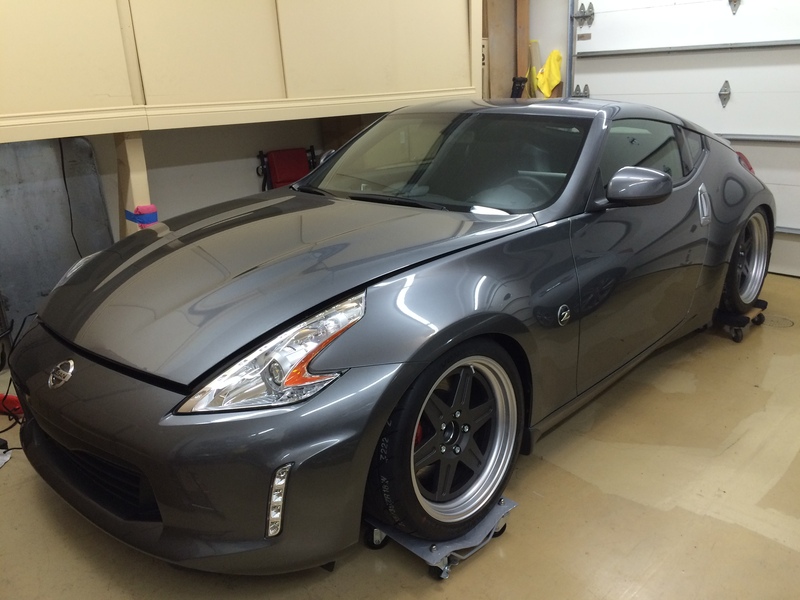 My thinking is the 370 should be making a bit more power than the 350's. I want to give the car the best chance it can have of putting it down, especially at a ProSolo. Most of the other fast Z drivers have abandoned the rear swaybar, but I'll be keeping one (the Hotchkis piece with lots of adjustments) on there for now. 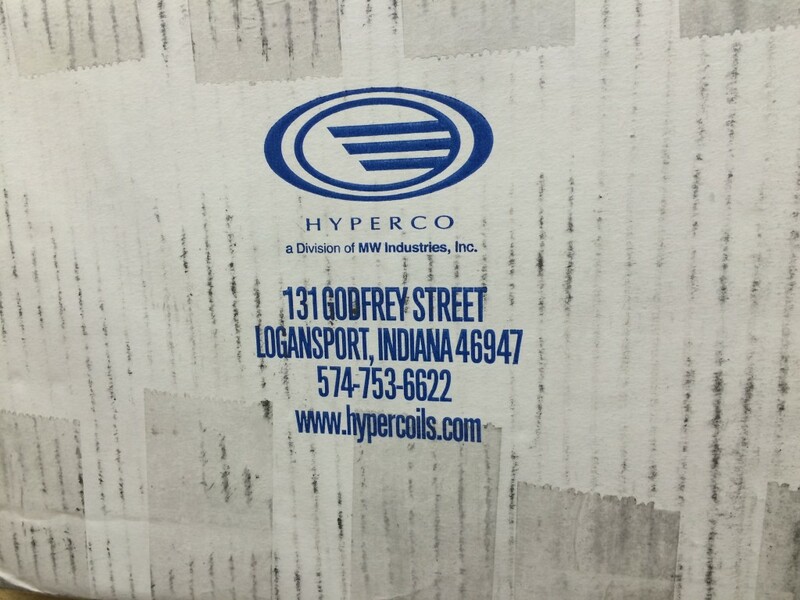 A week or so after I realized the 6"ers were too short, Jeff had Hyperco deliver a fresh box of longer coils to get the ride height out of the weeds.